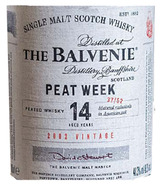 The Balvenie Peat Week Aged 14 Years (2002 Vintage) is a single vintage bottling, limited and rare by nature. This non-chill filtered expression is bottled at 48.3% ABV and matured solely in American Oak casks, providing a velvety and round taste with woody peat smoke balancing oaky vanilla and honey. Nose: Gentle sweet peat smoke with some lighter floral notes and delicate butterscotch honey. Taste: Velvety and round to taste with the peat smoke balancing citrus flavours, oaky vanilla and blossom honey. Finish: Gentle smoke with a lingering and creamy vanilla sweetness.